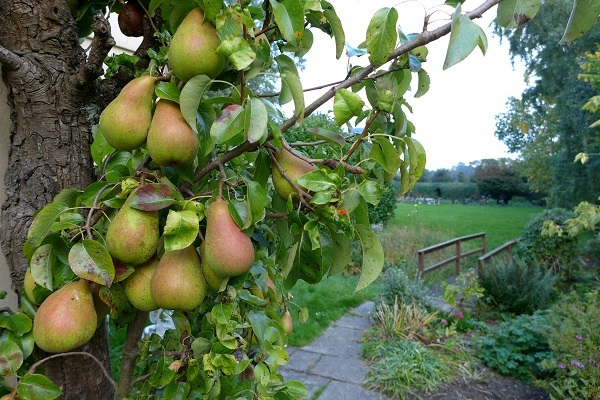 Ripening pears picked from the tree is a tricky business and one I’m still trying to master. Often they go wrinkly without ripening into slippery, honeyed perfection, so as I can’t bear waste I often end up poaching them instead. The advantage of this is that they soften and sweeten in the syrup of your choice and if you have too many you can bottle them to eat over the winter. 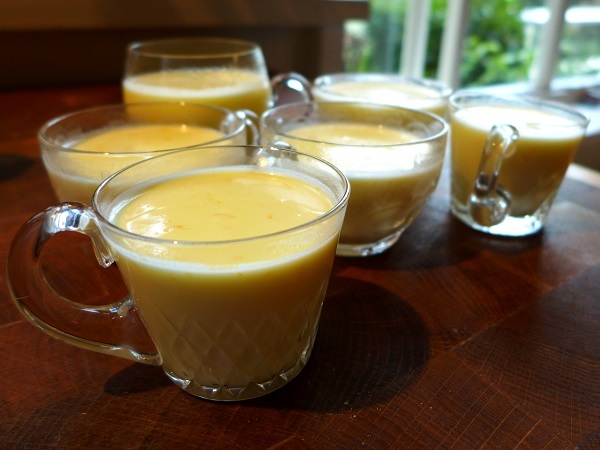 I’ve cooked them before with red wine and spices but as I had a lot of syrup left over from using candied ginger in my chutney recipe, I thought I’d go a bit medieval, mix the syrup with saffron and white wine and serve the results with an orange posset. Although in the 15th century possets were a warming drink, they’ve evolved over the centuries into a set cream, which is what I’ve gone with here. They will need at least three and up to 24 hours to set, so you can make them in advance if you prefer, along with the poached pears. And as most people won’t have nearly half a pint of ginger syrup hanging around their kitchen, I’ve given a recipe for anyone who wants to start from scratch. Cooking times depend on the ripeness and variety of pear you’re using. I’ve given a guide time but keep checking and remember they’ll carry on cooking as the syrup cools. Make the posset first as it takes time to set (see above). Scrub the orange under warm water to remove any wax coating. 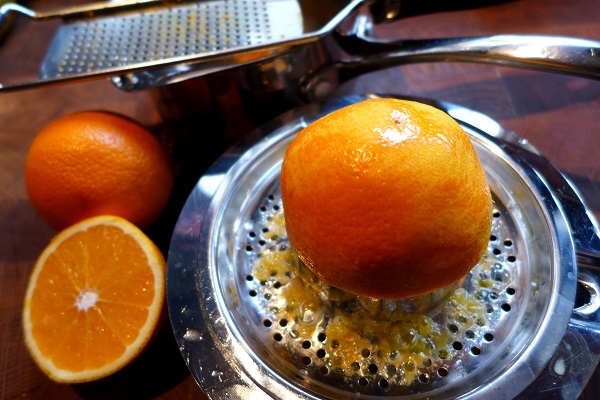 Zest and juice the orange – you’ll need about 100ml of juice – and place with the sugar in a small pan. Heat until the sugar has dissolved, add the liqueur if using, and keep warm. In another pan bring the cream to boiling point over a gentle heat and pour it, whisking gently as you go, into the orange juice. The acid in the juice will cause the cream to start setting. You can strain it through a sieve at this point if you like but I like seeing the flecks of orange zest. Pour into small glasses or ramekins, allow to cool, then refrigerate to set completely – preferably overnight. Don’t garnish them until just before you serve. Now make the syrup. In a pan big enough to hold all the pears, pour in the wine and add the syrup ingredients. Stir until the sugar has dissolved. Bring to a fast simmer then turn the heat down and cook gently, partly covered by a lid, for 20-30 minutes or until the ginger flavour has permeated the syrup. It’s a matter of personal taste but I don’t think the ginger should be strong enough to overpower the pears, just to give them a gentle glow. Strain and keep warm. Peel, halve and core the pears (try to retain the stalks) and drop them straight into the hot syrup as you go, so they don’t turn brown. When they’re all done, scrunch up some greaseproof paper and place it on top of the pears to stop them floating. 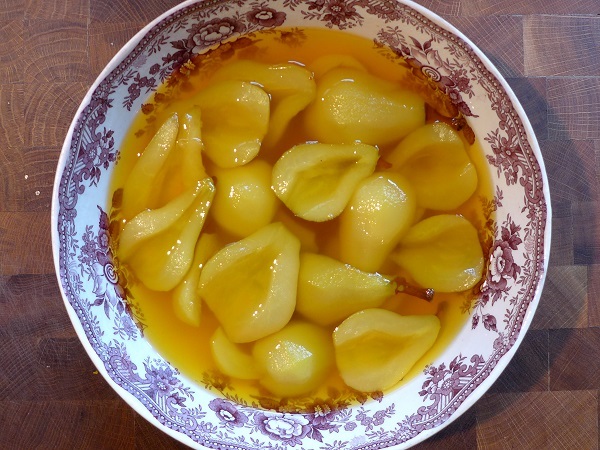 Put on a tilted lid, bring to a simmer and cook gently until the pears have softened, but stop before they go limp and soggy. Last year, mine took about 30 minutes, this year only 10. Remove from the heat, cover, and allow to cool completely before refrigerating. About 10 minutes before you want to eat, remove the pears from the fridge. 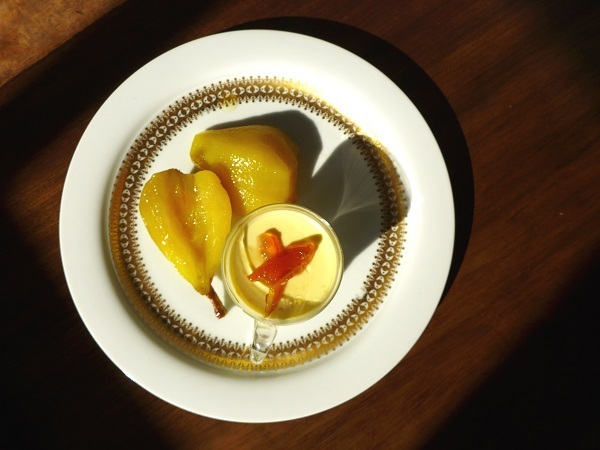 Garnish the possets with a little grated orange zest or a smidgin of Seville orange marmalade. If you want something crunchy to dip into the possets, you might like to try shortbreads or these finger biscuits (replacing lemon zest with orange zest). 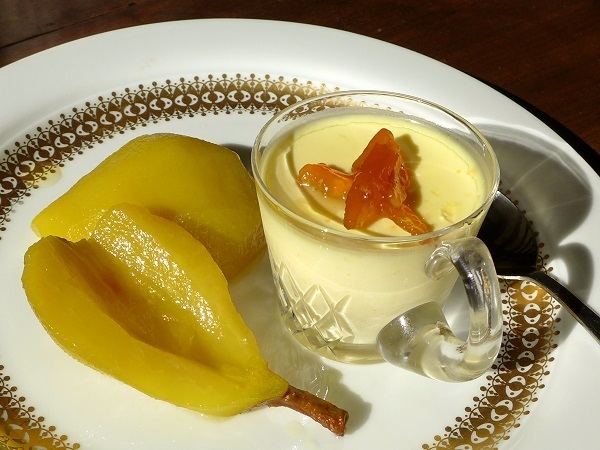 This entry was posted in Desserts, cakes and biscuits, Fruit, In the garden, Vegetarian and tagged orange posset, pears poached with saffron and ginger, poached pears, saffron and ginger pears by Linda Duffin. Bookmark the permalink. Thanks Nicole. It was PDG if I say so myself. I’m going to make more and bottle them for eating over the winter.